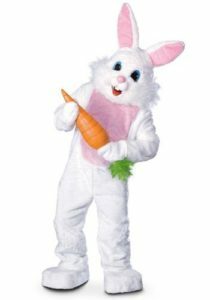 Hop on in to Beauty and the Beast Costumes to reserve an Easter Bunny before they all run away hiding eggs in other yards. Does the Church wardrobe department look a little empty? We can help out with Jesus Robes, Roman Soldiers, and Biblical robes for sale or rent. While most people are thinking about a new spring wardrobe and family time, we’re also hard at work on School plays! Most won’t notice that we are currently adding photos for “King and I”. This was a major addition to our Theatrical repertoire last year. This year’s addition will be “Mary Poppins”. It takes a while to get all the costumes photographed, the images cleaned up and posted. Now that we have the bulk of our Retail items on the website, we’re working on the rentals. If you need something for a play, please give us a call. We might have it! The most adorable twins in the world on their way to school for Dr. Suess’s Birthday in their costumes from Beauty & the Beast. We are frequently asked if we have costumes for the event and the answer is usually “No, we don’t have Thing 1 and Thing 2 or red and white hats.” But when your mom is wonderfully creative, things work out! A pink princess gown from the clearance rack becomes Cindy Lou Who with a little make up, a simple headband with craft stems, and an ornament made of card stock for a prop. A tiger costume with make up, extra ears and tail, plus added card stock apples is purr-fect for Ten Apples on Top. It’s all about thinking outside the box. We’re doing Spring Cleaning in the Winter. Our stock room is a disaster and we’re pulling out stuff we didn’t even know we had. All these items are getting dusted off, marked down and put out on the floor for bargain hunters, dress up boxes, school costume closets or whatever. Keep checking back to see what’s being marked down next. HINT: Click the “Shop” button above, and it will always show you the items most recently added to the site. While I’m at it, I’m making sure all the wigs are listed as I consolidate back stock boxes. Most of these are perennial favorites, they just didn’t get listed on the website earlier. Others are “Why is this still here?” items that will also be discounted. Yes folks, we finally got another Mehron Makeup shipment! Our stocks are back in good shape for the upcoming Convention, School Play and LARP seasons. We know that many people have been disappointed in our dwindling supplies after Halloween and we appreciate your patience. With the closing of another major source of theatrical makeup in our area, we had an unexpected surge in sales. Now that we have moved into the new year, we can look forward to keeping our stocks replenished to better serve our more professional customers. Christmas and Hanukkah are now over and everyone is looking forward to a Happy New Year! 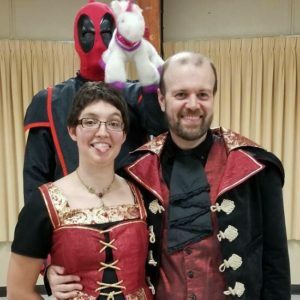 Here at Beauty and the Beast Costumes, we’ll be taking back all the rental costumes, doing laundry, washing and rolling Santa Hair, steaming the wrinkles out of his cleaned costumes and getting everything ready for storage. 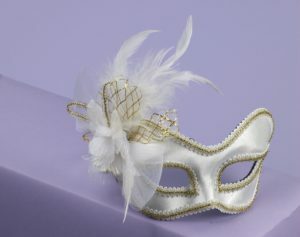 We’ll be getting the Masquerade masks back out for any New Year’s Masquerade balls and looking forward to Mardi Gras and School plays. As always, Santa has been very good to us here at Beauty and the Beast Costumes. We will be closed Christmas day, Monday December 25th. However, we will be here Tuesday the 26th to take back all those Christmas rental costumes and start packing it all away. This year, we plan on trying something different. We want to make Christmas items more accessible throughout the year. Most of the packaged costumes will be displayed on the back shelves. 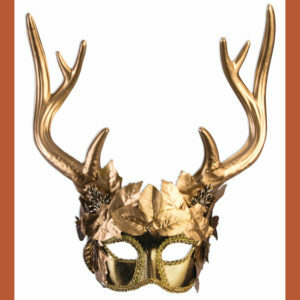 We want to move the back stock Halloween masks and clean the clutter out our first store room to arrange the Christmas items closer to the main showroom floor. Hopefully, these simple changes will make it easier for customers who are interested in “Christmas in July” promotional items and early holiday parades. Those who participate in the Hamilton Place ‘Santa Claus’s Arrival’ parade on the first Saturday of November as well as those who want Santa and elf costumes for Spirit Week or Halloween will no longer be turned away because those items are packed in the attic during October. 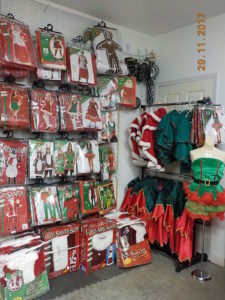 Beauty and the Beast Costumes, Chattanooga has the largest selection of Santa Suits to rent in the area. While we rarely run out of suits, come in as soon as possible for the best selection. Santa rentals come in three price ranges. Our most popular, Deluxe (left) dark red dress velvet “Department Store” quality suit rents for $75. The Regular (center) costume is bright red panne` velvet and rents for $55. The Economy version (right) is cozy red fleece for $35 rental. Each price range is available in sizes Large, XLarge, 2XLarge and 3XLarge and comes with Jacket, Pants, Hat, Belt, Boot tops, Wig and Beard set. Rental period is a couple of days through the week or a weekend rental lasts from Friday to Monday. Gloves and Glasses are sold separately. Looking a lot like Christmas! Christmas is in full swing at Beauty and the Beast Costumes, Chattanooga! Santa suits, Mrs. Claus dresses, Grinch, Snowman, Reindeer, and Elf costumes galore are everywhere. 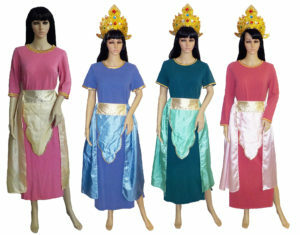 We also have a nice range of Angels and Biblical costumes for sale or rent. Don’t need a full costume? 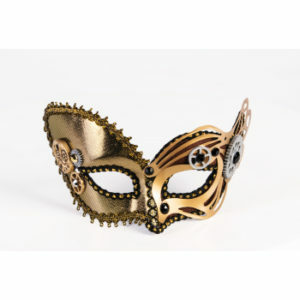 Check out our huge selection of accessories. To browse at home, just type “Christmas” into the search bar at the top right of this page, or choose a category to the right to be more specific if you need to rent or buy for Adults or Children. (Keep scrolling! It’s a long list.) Or just stop by our convenient location on Dayton Boulevard in Red Bank to see it all at once and make your selections. Yes, that’s right, Santa Claus and all his North Pole friends, plus Victorian Christmas Carolers are not only unpacked, but have been making plans since November 4th. 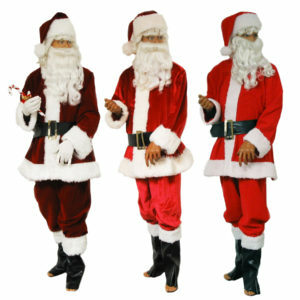 We’ve been booking Santa suits for parties, mascots for parades, accessories for a Nutcracker ballet performance and Victorian costumes for church pageants. If you need anything for Christmas, or Living Wax Museums for that matter, drop by and see what we can find for you. For the first time in 28 years, I spent October 31st with my family. We came together with another family to celebrate the union of our children in Matrimony to become one bigger, happier, crazy family.